A work by the foundational figure of African modernism, Sudanese artist Ibrahim El-Salahi. The artist’s intricately detailed compositions draw on Islamic, African, Arab, and Western artistic traditions. In The Last Sound (1964), a fascinating amalgam of muted abstract shapes and curves, angular lines are sparsely balanced across the square canvas. Referencing the passing of his father, a Muslim cleric, the painting’s title The Last Sound invokes the final elusive sound of a soul’s divine passage from the corporeal world to the eternal one. 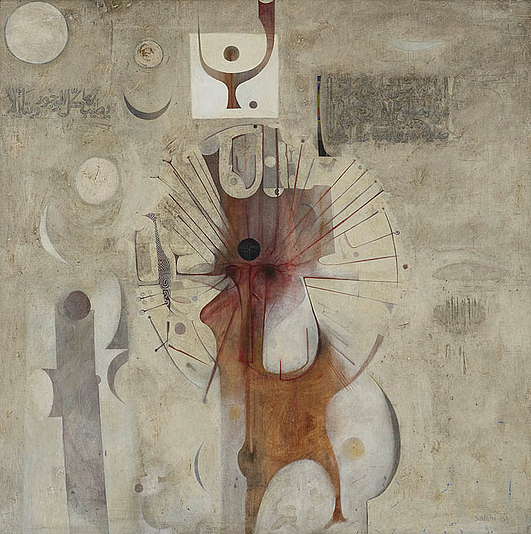 Making reference to the prayers for the deceased in Sufi Islamic practice, this work poignantly culminates El-Salahi’s view throughout his career that his creative production is channeled through his commitment to the spiritual process.